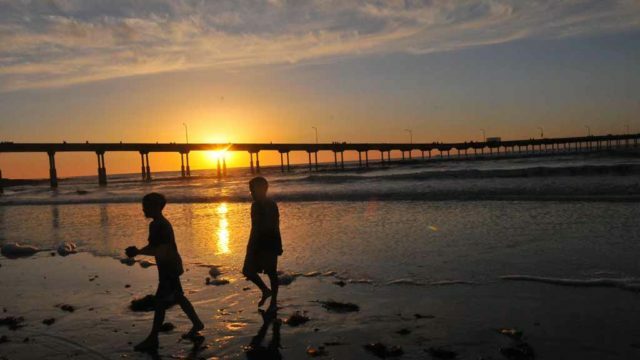 San Diego is sweltering under record warm days and nights thanks to a lingering heat wave and unusually warm ocean temperatures. The National Weather Service office here reported a record high nighttime low of 78 on Friday morning and a record daytime high of 88 at Lindbergh Field, the location for San Diego’s official measurement. “It’s official: the low temperature at Lindbergh Field on Friday was 78 degrees, which ties the all-time minimum at the airport,” the weather service said. More records are forecast for Saturday, with 74 degrees in the morning and 88 degrees later in the day. “This is due to the incredibly warm ocean water (for warm nights), and the strong high pressure aloft over the Great Basin (for warm days),” the weather service said. The Scripps Institution of Oceanography has recorded a series of record sea-surface temperatures off Scripps Pier, most recently 79.5 degrees on Thursday. That’s 10 degrees above normal.